The itemreceives power (radio partially works) . The radio antenna is in place. The buttons and knobs work. (can take four “D” or R20 batteries). The item in the photo is the one you would get. Battery Cells. WITH BOX & MANUAL CABLES. NO BATTERY WITH THIS, ITS TAKES 1X 9V BATTERY. USED AND WORKING. The item has been comprehensivelyTESTED and isWORKING. Digital synthesized AM/FM stereo tuner. Auto reverse tape playback. Rare Chance To Own Model Made Around The Year 2000 In Working Oder. Supplied As Main Unit With Matching Earphones. Rare vintage Philips D6608/00 Personal Cassette Player. Owned by myself since 1990. Features integrated speaker, carry strap and working headphones. Condition is used & working. There are some wear and tear scuff marks (see photos). Dispatched with Royal Mail 2nd Class Recorded. 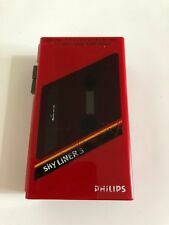 1980s Philips D6531 Vintage Personal Stereo Cassette Player. Unfortunately missing battery cover tested Working please message me with any questions Condition is Used. Dispatched with Royal Mail 2nd Class. This player has been tested and is in perfect working order. We will resolve any issues you may have with this item. Features include a 2-level bass boost, AM/FM/FM Stereo radio, belt clip, input for a suitable 3vDC mains adaptor (not included. Sorry, but no personal collection. purely UK mainland. Everything included will be shown in the pictures, text or both. ). Stereo in-earphones. Slim, compact design. High-quality finish. Detachable belt clip. ORIGINAL HEADSET, CLIP, MANUAL INCLUDED. GOODS WILL BE DESPATCHED ONCE FUNDS HAVE CLEARED. The outer plastic does have a crack along the side and top of the walk man and another one next to the ear phones. Two side cassette player, left side not working, but should be fixed easily. Otherwise the box is a classic version of the D6511. Numéro de pièce fabricant D6511. Very rare version for this cassette Walkman. with a Walkman of red color on the front. or a Walkman in black on the back. 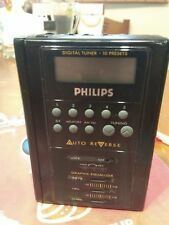 PHILIPS AQ6585 PERSONAL STEREO CASSETTE PLAYER, *** FREE P&P. In working condition with headphones and batteries. Unique serial number: 155920. Part number / Model: AQ 6492. Auto reverse - Cassette player: NO. Dynamic Bass Boost: YES. Belt clip supplied: YES. Fitted with new drive rubber belt - for the purpose to extend the life of this item. Graphic equalizer. Digital radio. Dolb y digital cassette sound. I don't know what is going on. Look exactly the photos. Condition: The walkman has been tested and works well. The box contains the original earphones and instructions. When closed, everything is ok but when you open it, it opens too much an can fall off, broken distance on the lid. -working but not properly, right channel does not work except when you pull out headphone jack a little - then both channels are working but mono, not stereo. Radio and Tapes plays well. Auto Reverse players. Vintage Philips NZ Cassette Player - For Repair. Powers on and Runs, but not smoothly especially when using ff/rewind. Counter not working. sound not tested (needs connector cables) Tape door cover is loose (see photo) and also missing a small strip below it. Strictly sold as seen for spares or repair only. Fully tested- radio works however tape player does not. Cash on Collection. EXCELLENT SERVICE.